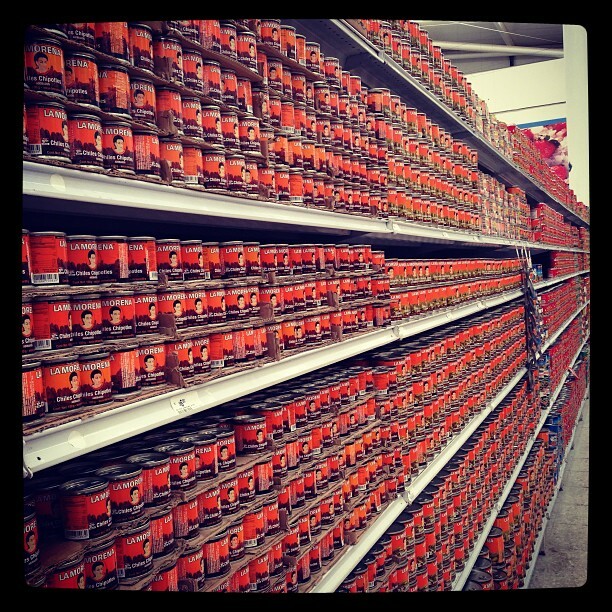 2) In supermarkets there are rows and rows of yogurt and yogurt-drinks. But it’s nearly impossible to find any without sugar or high-fructose corn syrup. It’s also interesting to me that milk is sold in cartons like we use for soymilk or almond milk in the U.S. (not needing refrigeration). 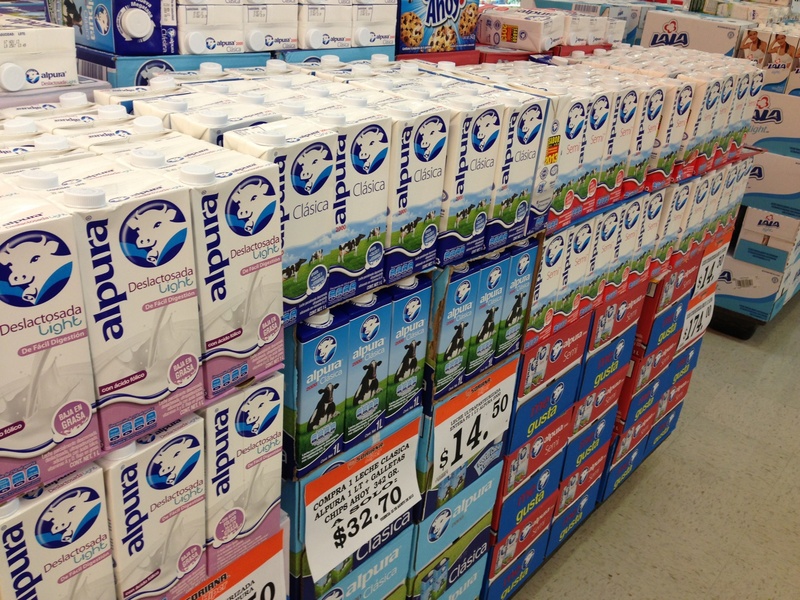 Lactose-free milk is popular. I don’t drink milk except for almond milk, which eventually I was able to find. (Sometimes it’s hard to find the kind without sugar, though). 3) It’s a little hard to find good black tea. I’m a fan of good oolong tea, which is hard to find. Herbal teas are very popular here. 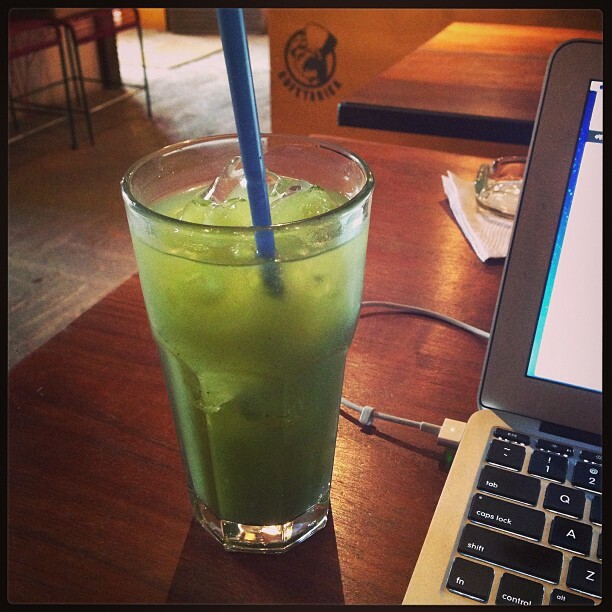 At one of my favorite hangouts (Gourmand), they have excellent orange mint iced tea (I order it without honey). 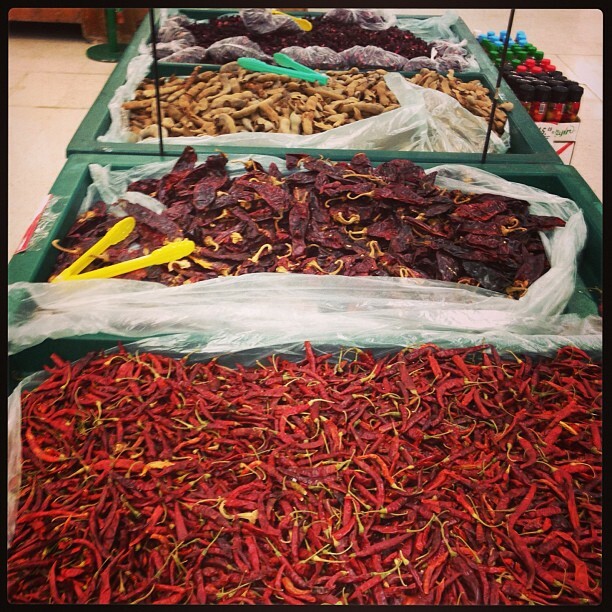 4) I have never seen so many types and varieties of chiles anywhere! Dried and canned. There are huge bins full of them in stores. 5) I don’t know why, but it’s hard to find lemons. 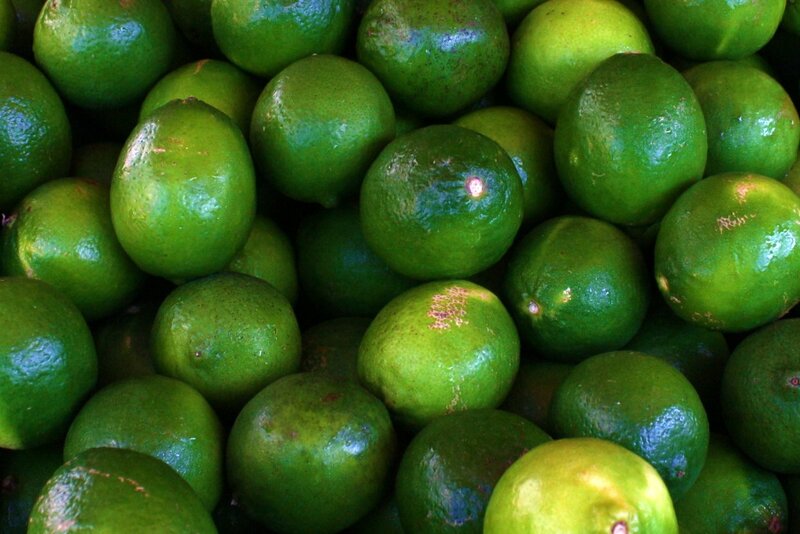 Limes are everywhere and come in different sizes. I found something that looks like lemons in a health food store, but they didn’t taste like lemons. 6) I like that in restaurants & cafes you can sit around for as long as you want… they don’t bring the check until you ask for it. But they do tend to remove your plate the very second you take your last bite! Sometimes it’s disconcerting! One good thing, though is that free Wi-Fi is available just about everywhere. 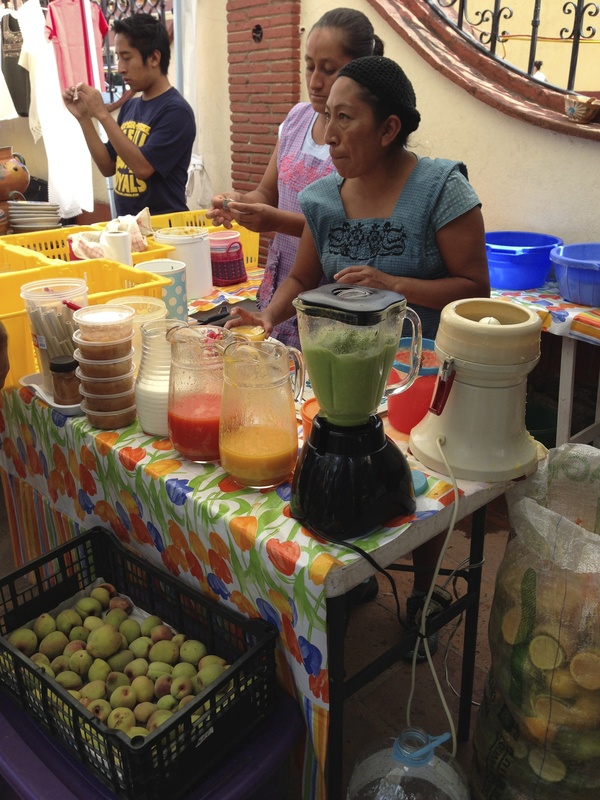 7) You can get fresh corn tortillas from street vendors, local markets, and little stores that make them fresh. 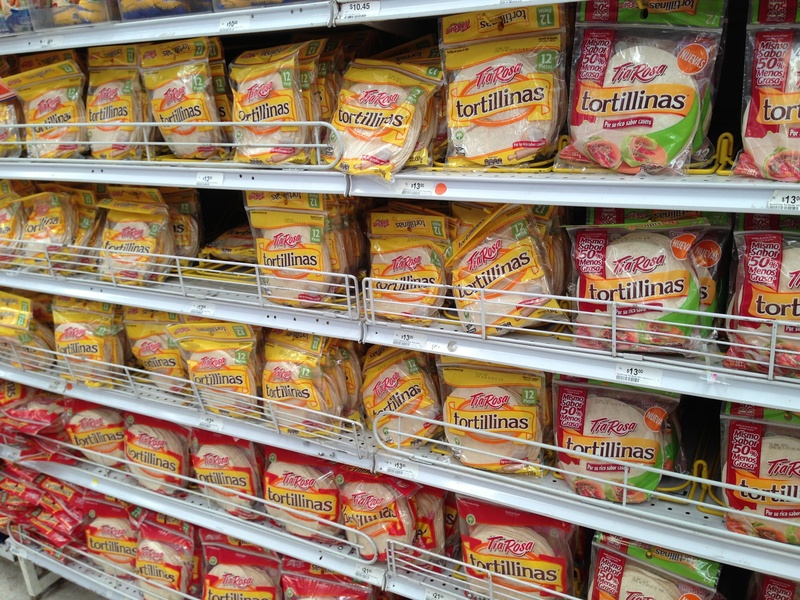 But in supermarkets they only have wheat tortillas (lots of them). 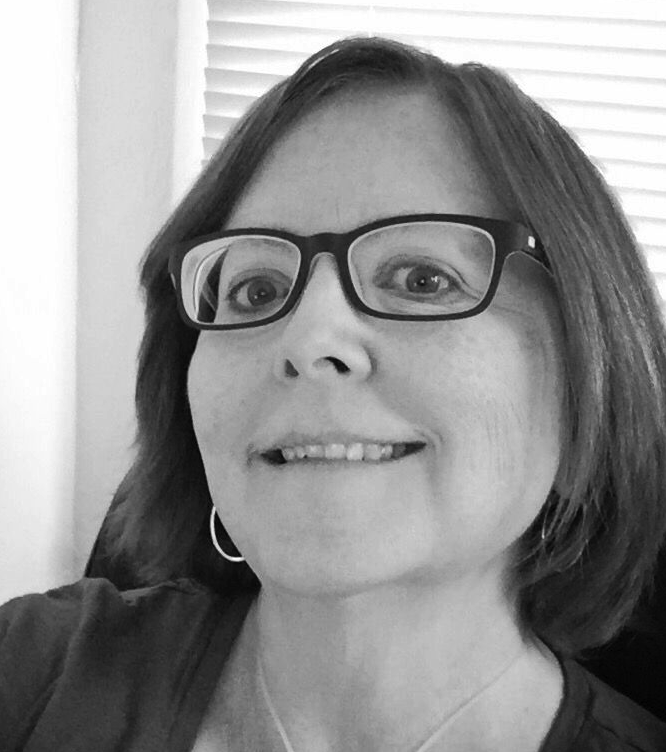 I prefer to eat gluten-free, so I like the corn ones. They do have crunchy corn tostada shells in stores, but not corn tortillas. 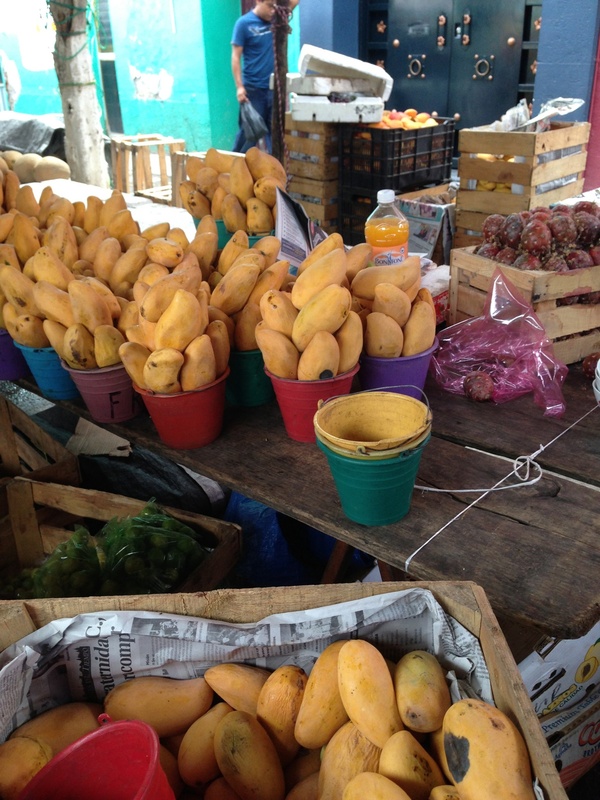 8) There are many types of mangoes here. 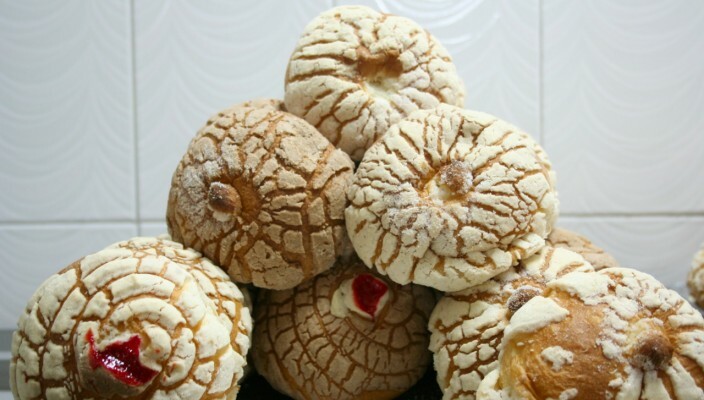 My favorite are Ataulfo mangos. In Boston I could only get those for a few months per year. Here they always have them and they are bigger and taste great. 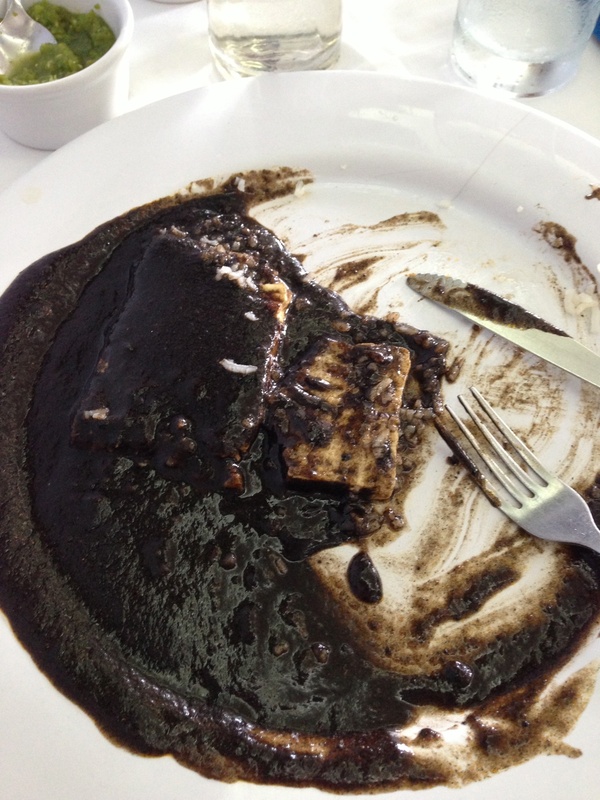 9) Oaxacan chocolate is grainy with cinnamon and spices. You can get it made with either milk or with water. Water is the traditional way and the way I prefer it. It’s best as a hot chocolate drink. If you eat it as a bar it’s usually super-sweet and to me tastes more like cinnamon than chocolate. In stores, milk chocolate is everywhere (the usual candy bar brands), but dark chocolate is harder to find. Sometimes I can find an imported dark chocolate bar (a little bit pricey). 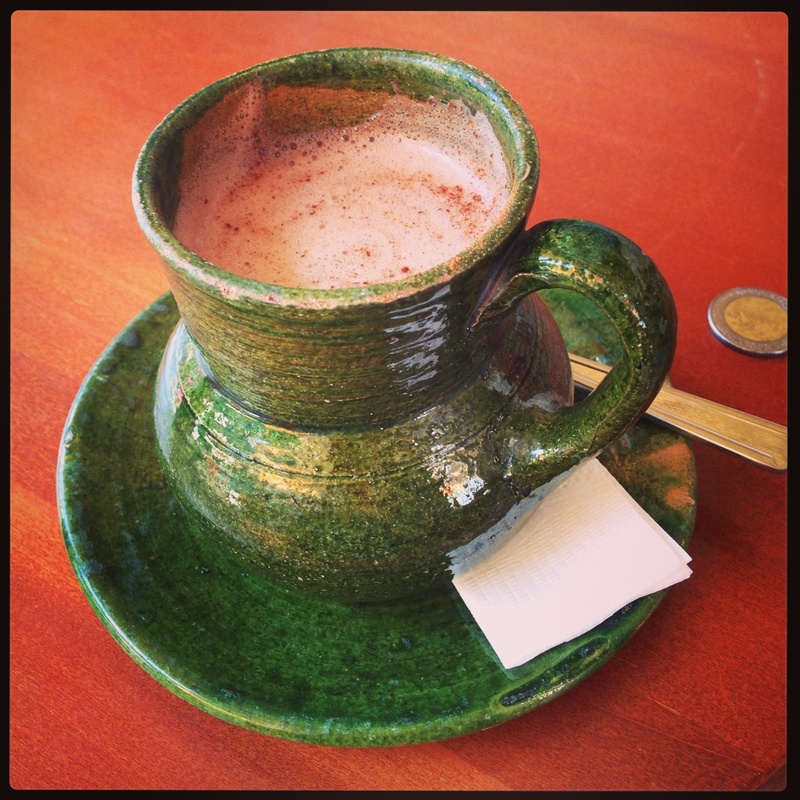 Oaxacan hot chocolate – very good! 10) Bread is everywhere here. I don’t eat it (since I’m gluten-free), but if you do, they have many varieties of fresh-baked bread everywhere. They eat a lot of white bread, dipped in hot chocolate. 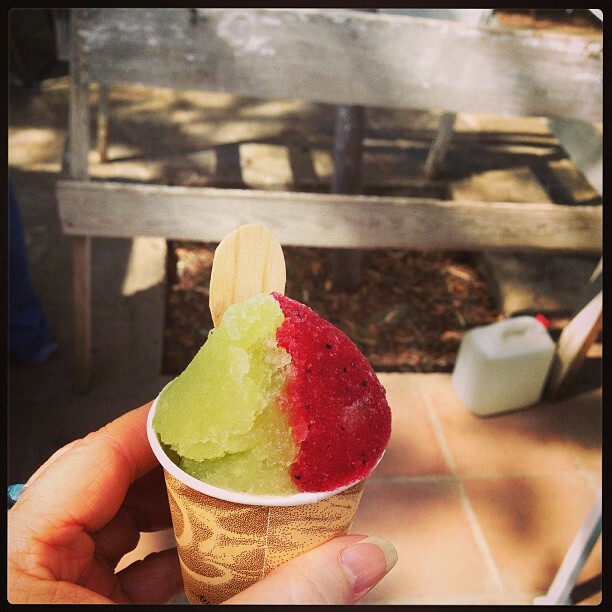 11) Ice cream and sorbet are very popular. I like that the serving sizes are tiny! 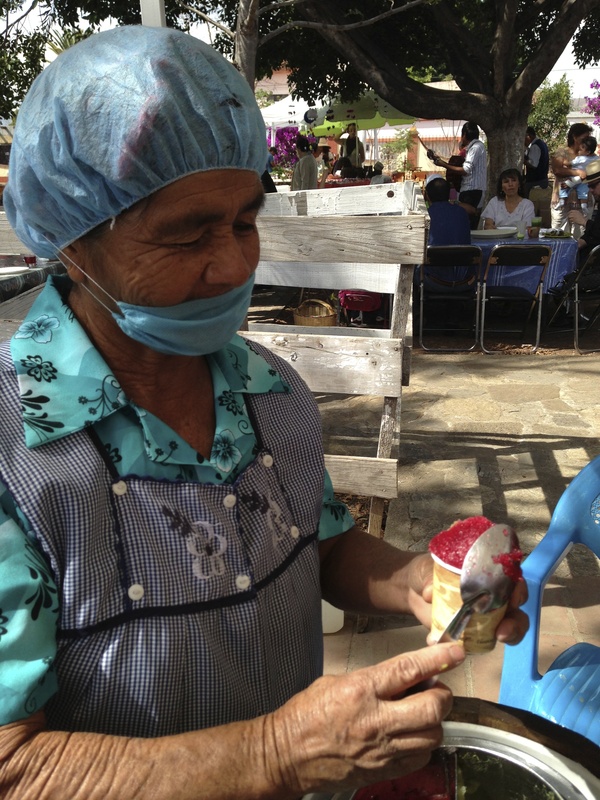 The best are fresh-made “nieves”… usually it’s sorbet in lots of unusual flavors like rose petal, or “tuna” fruit (a red sweet fruit). 12) Serving sizes for most everything are much smaller than in the U.S. It makes me happy and reminds me of how oversized everything has become. The one exception is when people are at the movies. 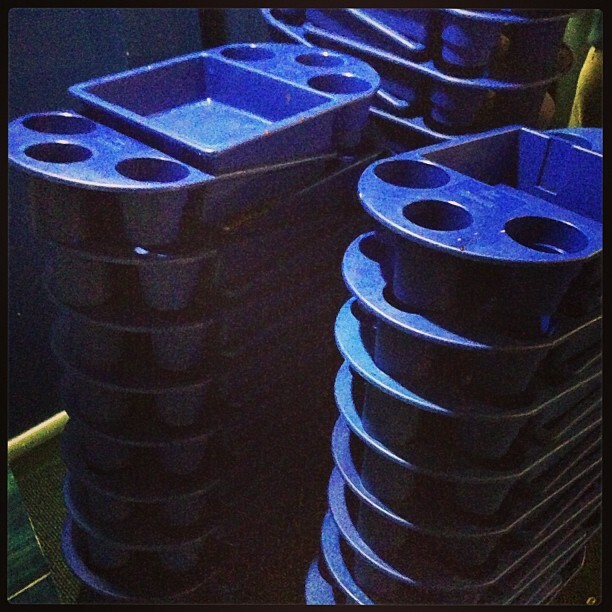 At the one of the movie theaters here, they have giant blue bins for carrying all your movie snacks to your seat. 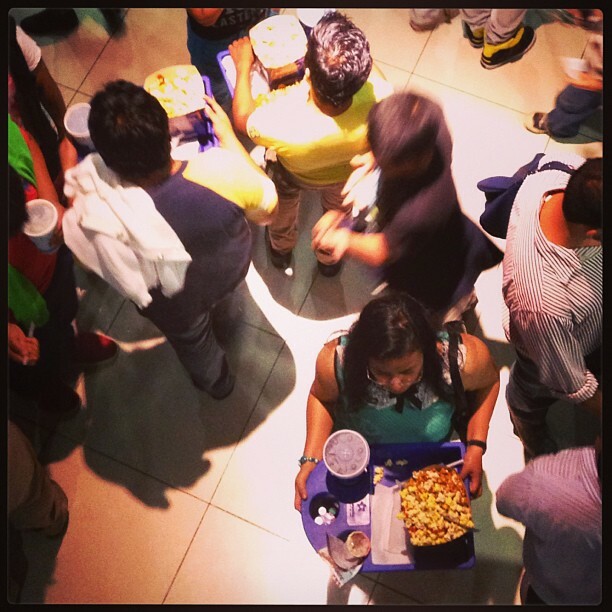 People fill them up with super-sized drinks, candy, and different flavors of popcorn (popcorn with chili is popular). 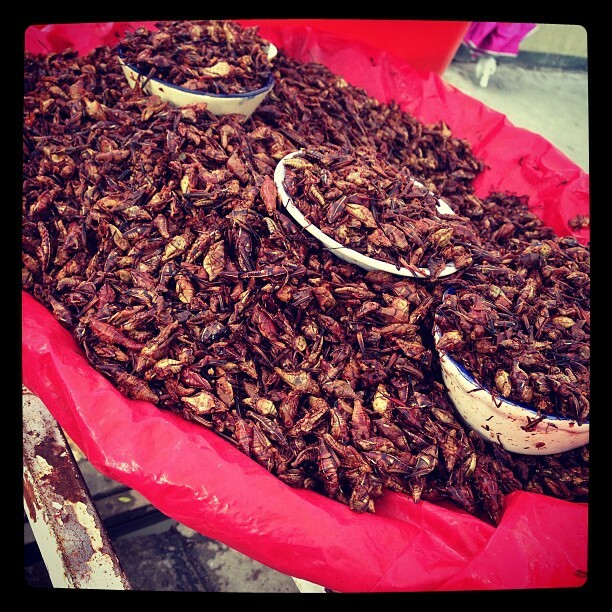 13) Fried, spicy grasshoppers are a popular snack. 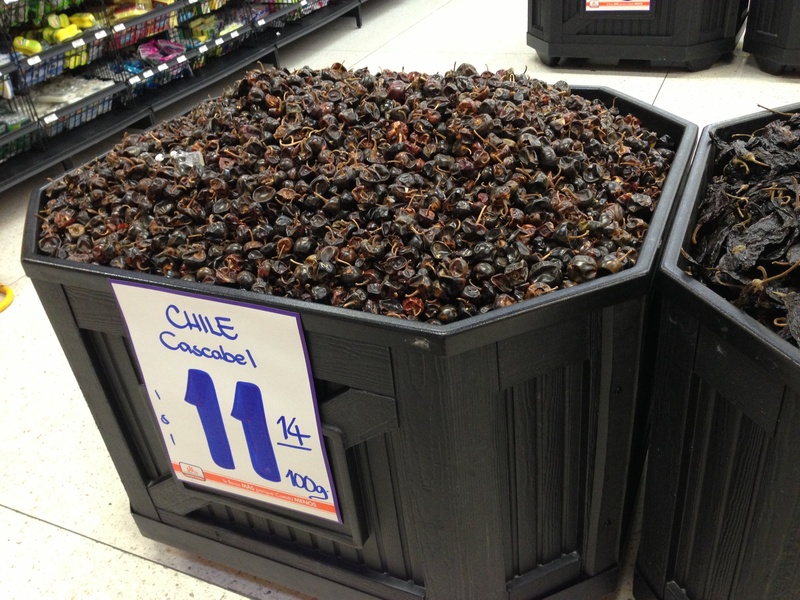 (chapulines) I don’t eat them, since I’m vegetarian. 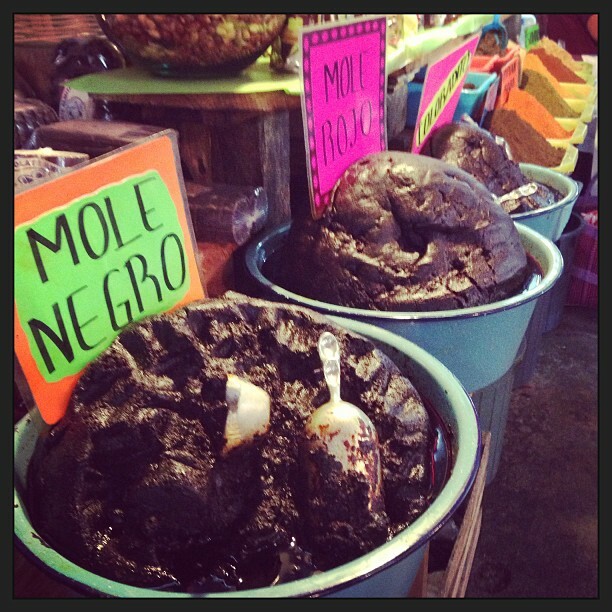 Vendors offer them to you on almost every street corner and in the markets. 14) Fruit waters are very popular. I love these. 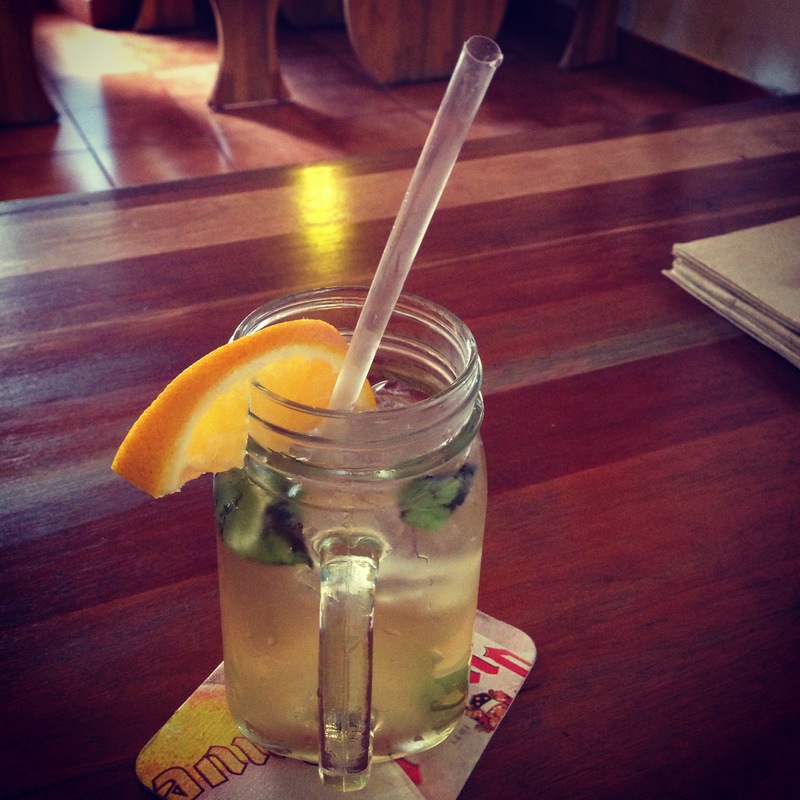 They often will bring a pitcher to your table of fruit mixed with water… very refreshing. 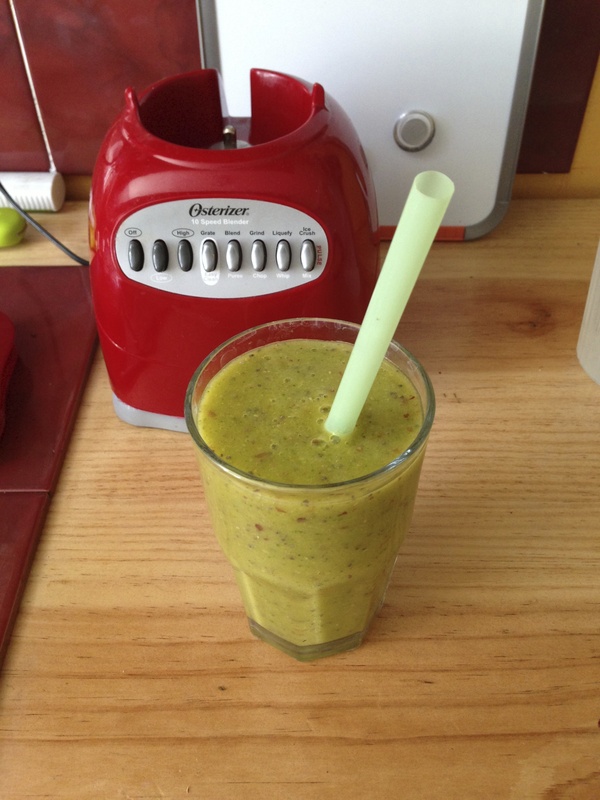 My favorite is cucumber with hierba buena (mint). 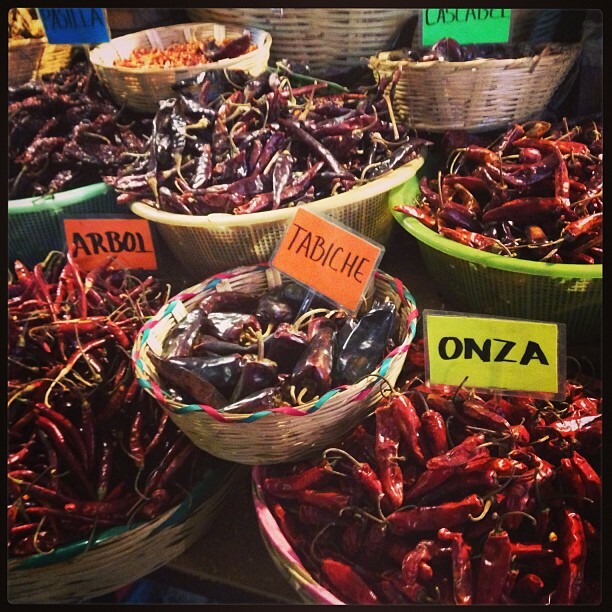 15) My favorite outdoor market is Pochote Organic Market, held on Fridays and Saturdays. 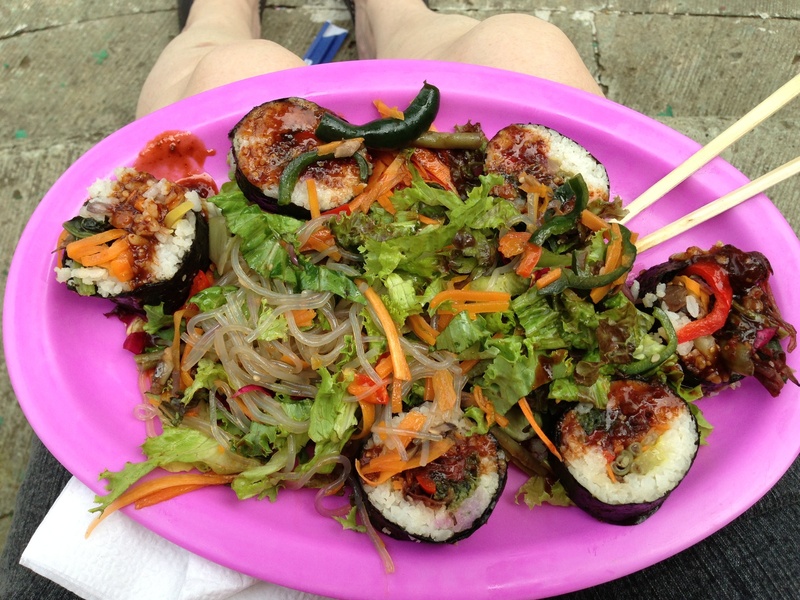 You can get a variety of prepared foods, even vegan sushi (with hot chili sauce, of course!) I was about to say no when I saw them adding hot sauce to my sushi, but I decided to try it and it was really good! 16) My favorite local restaurant is La Olla. 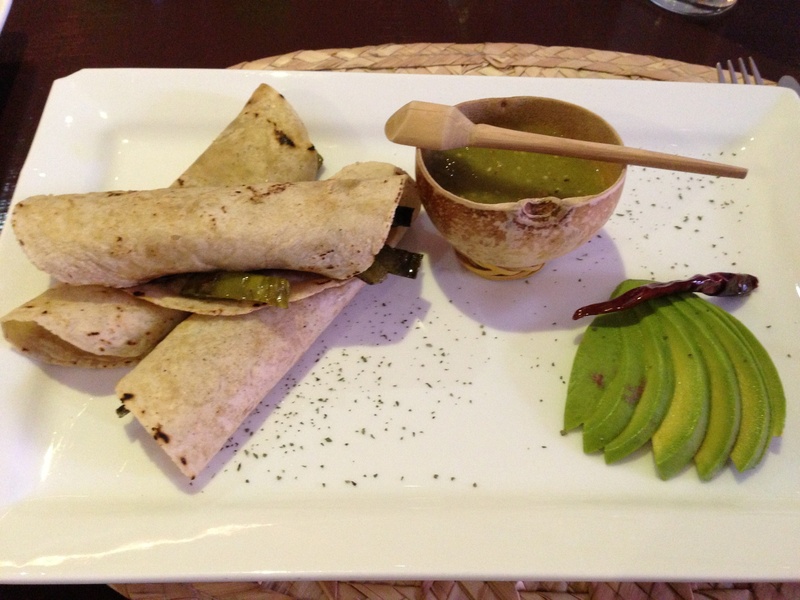 I like their cactus tacos (which I ordered without cheese, since I was eating too much cheese). 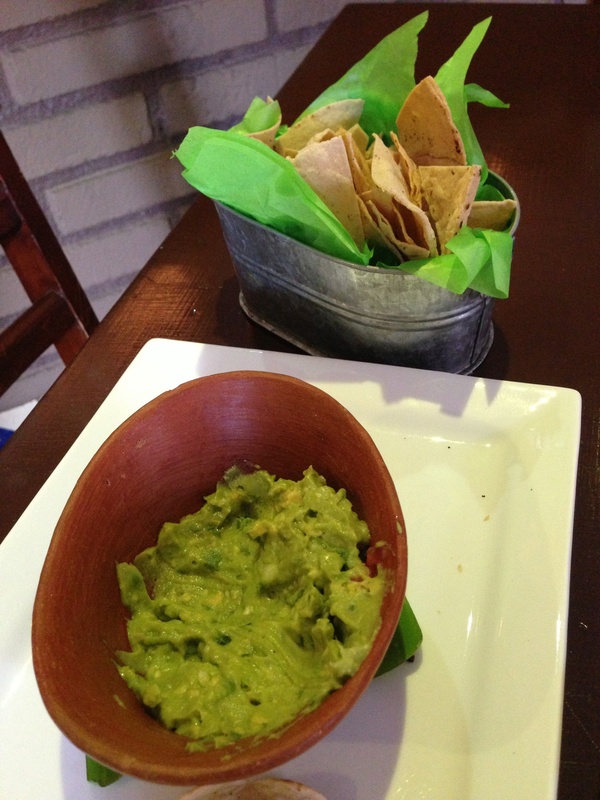 Their guacamole is great, too. 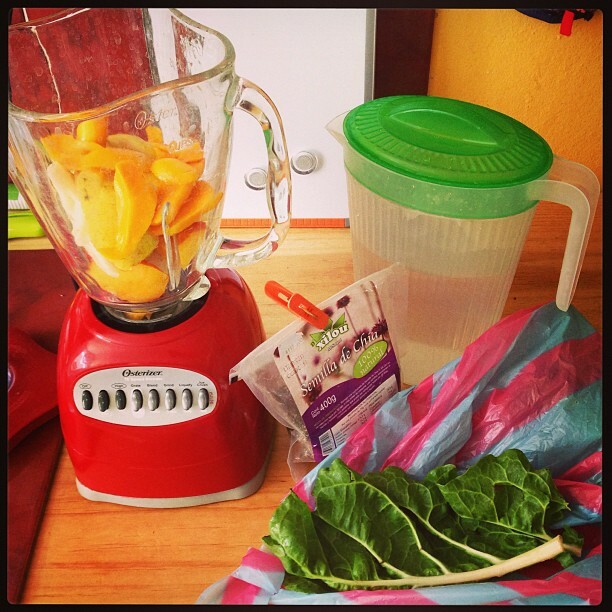 Smoothie made with mango, frozen banana, nectarine, water, and swiss chard.